Adorning the perimeter of many commercial buildings, the willowy Bamboo stands, in containers and planter beds, providing screens and landscape focal points. Its reputation as a renewable resource for flooring to furniture and even fabric, make it emblematic of the sustainability movement. We maintain several sites in San Francisco with Bamboo plants and we appreciate their beauty, first-hand. They are finicky though, and need to be planted in just the right micro-climate. Because of its heightened interest we thought you might be interested to know more about them. 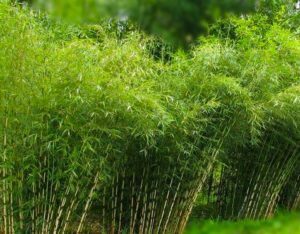 Each Bamboo will have slightly different characteristics so in the interest of brevity we are providing general tips that apply to most Bamboo plants. There are numerous varieties of Bamboo. 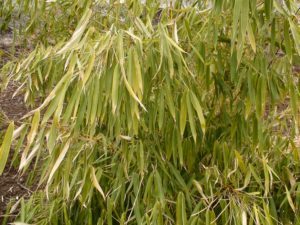 One clarification – Lucky Bamboo is actually not a Bamboo. It comes from the Dracaena family. Bamboo grows by spreading horizontally through “rhizomes”. 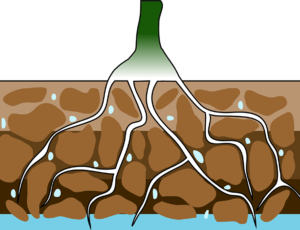 Rhizomes are modified stems running underground horizontally. They represent a part of plant production and also store nutrients. 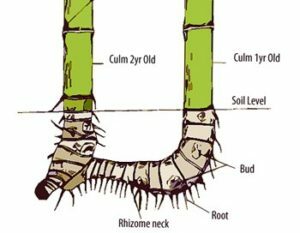 Below to the right is a simple illustration that points out the main parts of a Bamboo plant: the Culm and Rhizome. One of the challenges of Bamboo is that it can be invasive. The benefit of Clumping Bamboo is that its rhizomes do not spread so rapidly. They are also slightly more drought tolerant. They have long Rhizomes which enable them to spread rapidly. This type of Bamboo is considered invasive. Full sun. That means 5 hours of sun. Well draining soil is preferred. Amend clay soils to improve drainage. Water once or twice a week for a young Bamboo. Bamboo does not tolerate soil that is too saturated. Roots that sit in water can rot. Abundant sun combined with dry wind can stunt the growth of a Bamboo and cause winter burn. The larger container the better. One source suggests 18”x18” and 18” deep box is the smallest size container they recommend. Your container should be wider than it is tall. Potting soil dries out more quickly and it needs to be moist (not wet). Make sure your container has drainage so the plant is not sitting in water. Bamboo is dormant in the winter. Best time to fertilize is spring and summer. They need occasional pruning and thinning. Once any part of a Bamboo is cut, it will not grow back. Bamboo leaf litter is actually good for the soil. Although in urban environments it may make the base of the plant look messy. Because of how the Bamboo grows it will usually have a mixture of new and dying or dead leaves. This can be frustrating for their owners. Some varieties can shed as much 30% of their leaves at a time.